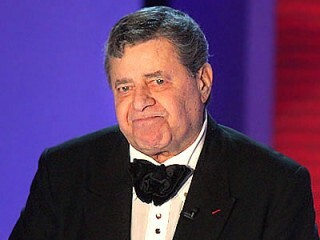 Jerry Lewis, born Joseph Levitch is an American comedian, actor, film producer, screenwriter, film director and singer. He is best-known for his slapstick humor in film, television, stage and radio. He was originally paired up with Dean Martin in 1946, forming the famed comedy team of Martin and Lewis. Slapstick and funny-face specialist Jerry Lewis was one of the top movie comedians of the 1950s and 1960s. Lewis and Dean Martin were a hugely successful comedy team of stage, screen and radio. They made a string of popular movies from 1949 to 1956, with Martin as the straight man and Lewis as the zany cut-up. After they ended their partnership, Lewis went on to produce, direct and star in comedies such as The Bellboy and The Nutty Professor. Lewis is widely known for his annual Labor Day telethon, a charitable event raising money to fight muscular dystrophy. Lewis was given the Jean Hersholt humanitarian award at the 2009 Academy Awards, honoring him as "an individual in the motion picture industry whose humanitarian efforts have brought credit to the industry." Prednisone treatments for a lung ailment caused Lewis to gain a great deal of weight in 2002. For more details, see this 2002 BBC report... In the 1990s Lewis was a hit playing the Devil in the revival of the stage play Damn Yankees... Lewis received the French Legion of Honor in 1984; his extreme popularity in France has become a running gag with some American comedians... Lewis's longtime co-host on his annual telethon is Ed McMahon... Lewis was never nominated for an Oscar in his acting or directing career. However, he did co-host the Oscar ceremonies in 1956, 1957 and 1959. View the full website biography of Jerry Lewis.